Just 1.8 liters, four cylinders and 252 horses don’t sound that impressive by modern standards. But when you remember that motor has been massaged by RenaultSport, and that it goes in the reborn Alpine A110, you know you’ve got something good going on. Renault-Alpine recently got in touch with a handful of French media outlets to try out their all-new Alpine A110 for themselves at their test center coinciding with 24 Hours of LeMans festivities. Here, get your ear-holes ready for 16 minutes of pure Alpine A110 engine noise. You’re going to want to turn the volume up on this one. If you aren’t familiar with the name of this sports car or the heritage it carries, to the average car person this all-new Cayman competitor can be a bit of a mystery at first. Launched in 1961, the original Alpine A110 took Alpine’s timeless principles of compact size, lightweight, and agility and made it into a rally championship winning car. In 1973, the Alpine dominated against Fords, Saabs, Datsuns and Citroëns. The latest rebirth of the A110, at first glance, pays homage to the original done right. Not built on an existing platform, this A110 is entirely bespoke riding on a lightweight aluminum chassis. Behind the driver, and the star of that video, is a 1.8-liter turbocharged engine from Renault-Nissan that makes 252 HP and 236 lb-ft. Tipping the scales at just 2,381 pounds, it’s easy to see why this A110 scoots around those mountain roads. If you didn’t already know, no manual will be offered, just a shiftable dual clutch. 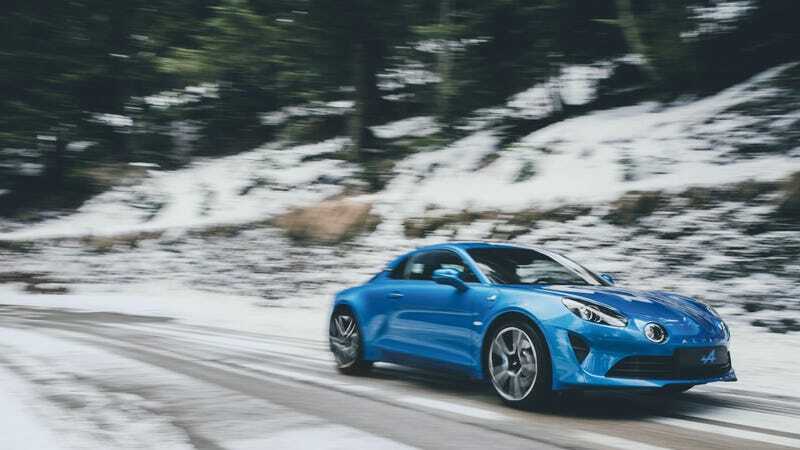 Alpine is set to make the A110’s public debut next weekend at the 2017 Goodwood Festival of Speed. Maybe Nissan can find it in their hearts to bring it here, but I’m not optimistic.